While silently motoring along in the i3 like a glass-dome hooded extraterrestrial, I happened to stumble across an E30. This humble 325i was parked along one of Amsterdam’s many canals, sitting somewhat derelict in solitude. A photo-op beckoned. Perhaps the following photos best illustrate how far BMW has come in automotive design over the last three decades. To look at these two cars side by side leaves you with the impression that one just fell from a UFO in a landing pod, rolled out from the pod like a carpet, then morphed into a steely-eyed electric car – Transformers style – while the other was built by hard-working men with sweaty brows in a dimly-lit Bavarian factory. The contrast is stark. If you’re a regular reader of BMWBLOG, you’ll know that the E30 is my all-time favourite BMW. I love it for its simplicity, its light-weight, brilliant handling dynamics, fun, colourful personality, and legendary racing pedigree. It’s timeless, aged as it may be. To surpass or even match the E30 on the smile-metre takes a lot, and few cars – few BMWs – if any, have managed to replicate the feeling you get behind the wheel of the ultimate ‘Ultimate Driving Machine’. Full disclosure: nostalgia may also have a hold on me as the E30 was the first BMW I ever drove, and the first BMW I owned. The feeling you’re fed from behind the wheel is intoxicatingly rich, exhilarating and fun – even if you’re not necessarily hitting warp speeds. 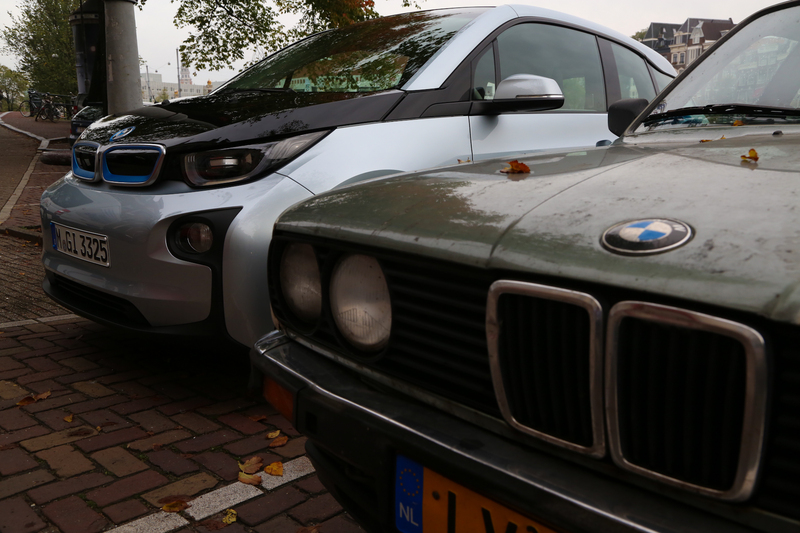 Significantly and shockingly (sorry, pun intended), the contrast between these two cars, the i3 and the E30, exists mostly in aesthetics, less so from behind the wheel. Technologically speaking, you couldn’t find two more estranged cars. Yet when it comes to the driving experience, the fun factor, and the playful handling, these cars are clearly bred from the same family of cars, even if separated by many generations down the ancestral line. They both deserve their roundel, displayed proudly on the hood. When you start to crunch the numbers, you’ll discover that these cars share much in common in terms of their dynamics. For example, the E30 325i sports 168 hp and 164 lb-ft of torque while the i3 spins out a similar power figure of 170 horsepower and 184 lb-ft of torque. 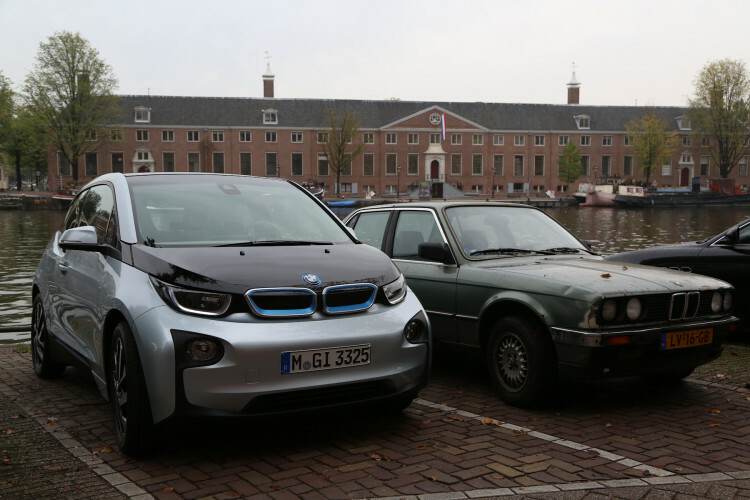 The E30 325i takes 7.7 seconds to hit 100 km/h (62 mph) while the i3 requires 7.2 seconds. Still not sold? 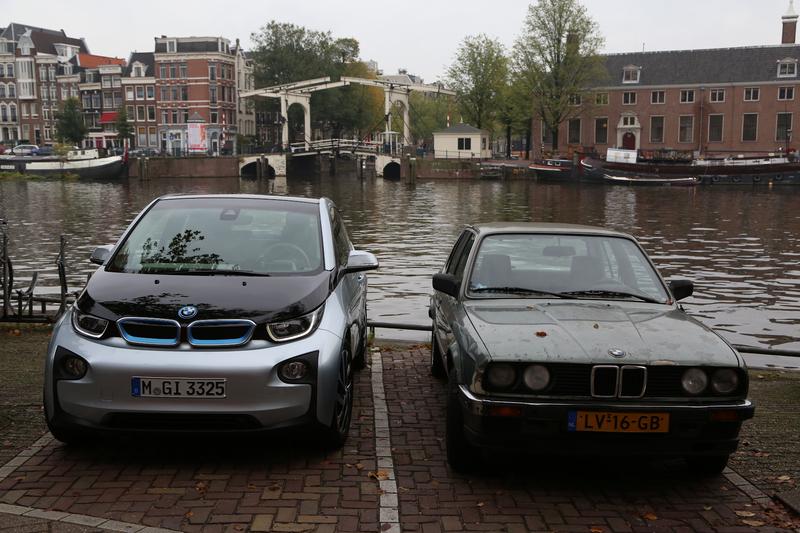 Check out the curb weight: the E30 325i tipped the scales at 1,275 kilograms (2,811 lbs) while the i3 weighs 1,195 kilograms (2,630 lbs). Yes, you read that correctly – the i3 is lighter than the E30 was, even despite its hefty battery pack. Never mind the structural rigidity – the i3 is many times stiffer than the E30 chassis of yore. Folks – we have a very special car on our hands. These striking numerical similarities are felt from behind the wheel. The i3 darted through a wet autocross with incredible precision, agility, and road holding. The car turned in with immediacy and exhibited only mild understeer, easily mitigated by forward weight transfer. When powering out of a corner, you can feel the rear tires losing grip and the rear end wanting to step out (though electronics limit sideways fun as verboten). The i3 felt light on its feet and it was fun and tossable, hungry to devour an autocross or tight, twisty road and rewarding such driving aggression with impressive speed. Sure, on an open racetrack it would quickly run out of pace (and charge), but at least in the realm of the autocross, the E30 has met a venerable match from within the fold. An electric great grandson. It can be proud of this prodigy. This level of driving fun had me giddy and grinning from turn to turn. I genuinely looked forward to driving the i3 after dinner breaks and driver swaps. And I already miss its playful driving experience. 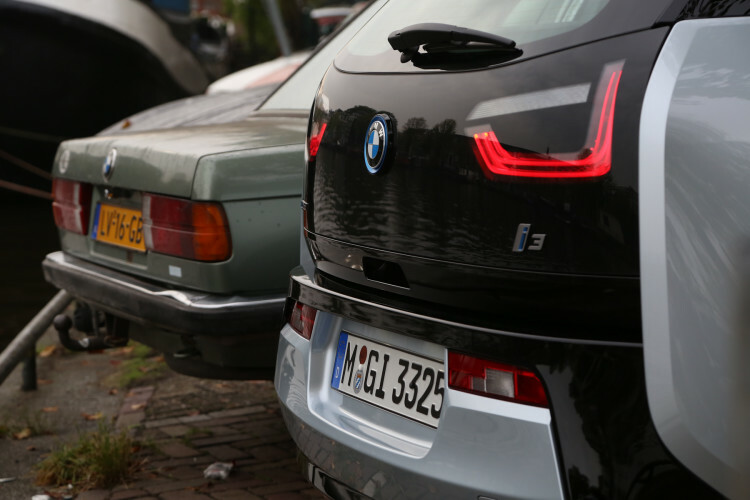 The i3 has thus managed to encapsulate much of what made the E30 so great – a legend for the brand. Of course, it’s done so from a radically different approach – using a rear-mounted electric motor where the E30 has a front-mounted gasoline engine; arriving at a similar curb weight by employing a supercar-worthy CFRP and aluminum sub-frame design whilst packing on hundreds of pounds by way of the battery pack – but ultimately engendering the same driving fun that’s built an E30 cult-following. Go-kart steering ratios, uber-light curb weights, neutral, agile handling and wake-up-excited-to-drive emotions seem old-fashioned these days, having all but disappeared from the automotive landscape, but I’ve found these qualities, dynamics and emotions while driving the i3. I still have my reservations about electric cars, namely their limited range and the environmental impact of their batteries, but if the future is electric and the i3 is BMW’s first stab at electric car design, then consider me electrified. BMW have somehow managed to wind back the clock while creating the future of the electric car. I’ve yet to drive the i8, but I expect similar levels of driving fun thanks to a centre of gravity 4 cm lower than that of the current E92 M3, boundless torque from zero rpm, and a low, lithe curb weight. If BMW build upon the i3’s character and enhance its fun factor, we’ll have a bona fide BMW sports car on our hands. Maybe – just maybe – we’ll have a newly-birthed contender for the ultimate ‘Ultimate Driving Machine’. After driving the i3, I firmly suspect so. The Porsche 918 Spyder has recently established that hybrid-electric sports cars are legitimate in the arena of motorsport – setting a stunning Nurburgring production car lap record of 6:57, shaving more than 4 seconds from the previous Dodge Viper ACR lap record in the process – so there’s no longer any reason to cling to anti-hybrid sports car notions. The i8 may just be the M3 we’ve all been pining for since the last E30 M3 rolled off the line. Different in every way except fun factor and light-weight dynamics. Brothers from the same mother, lost in time. Or perhaps the new M3 / M4 will be the BMW sports car we’ve longed for, thanks to a lightweight design approach shared with BMW i. Either way, I’m thrilled to see the direction BMW is going – and feel it from behind the wheel. Starting with the F20 1 series (see review here), I’ve felt a definite move towards lightweight design, harkening back to the E30, and several models since have lost weight and found their share of classic BMW personality. 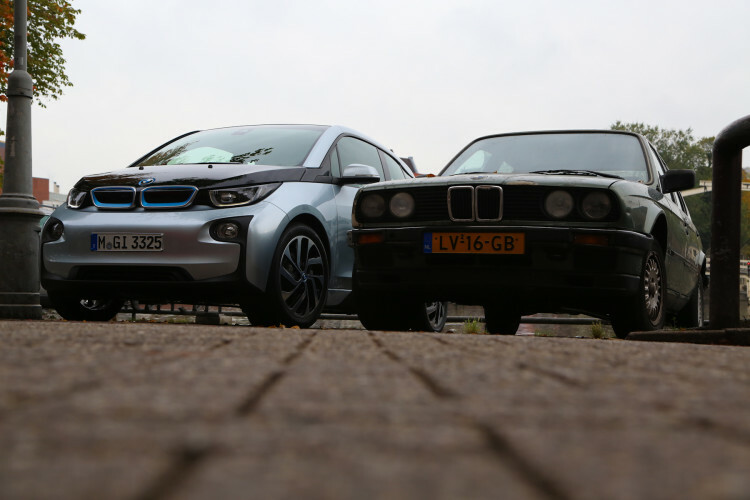 Some may find it heretical that I compare the i3 and E30 for their similarities and differences – but after driving both, I can’t deny the emotional parallel. In technology and time they are worlds apart, but my smile was roughly equivalent.